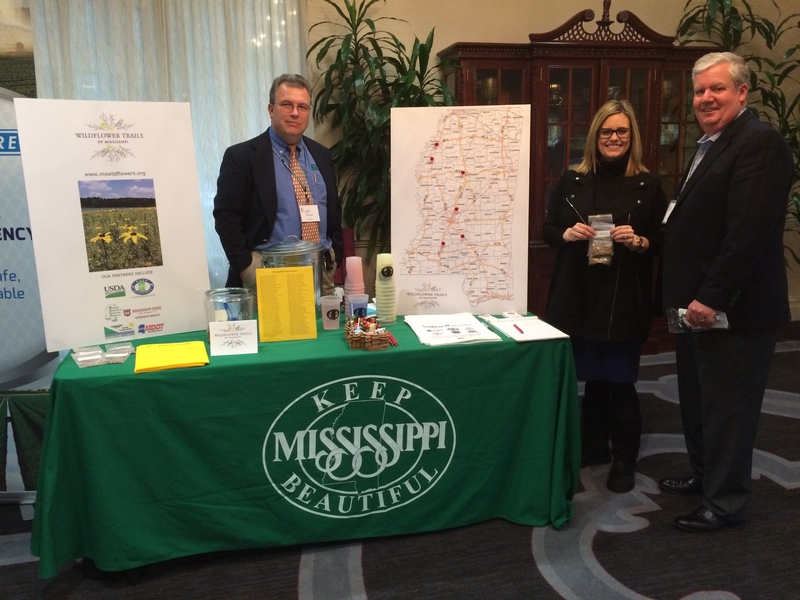 Keep Mississippi Beautiful’s Neeley Norman and Sarah Kountouris tell conservationists about wildflowers at recent Mississippi Association of Conservation Districts annual meeting. Photo by Judi Craddock. Last week, we met with conservationists across the state at the Mississippi Association of Conservation Districts annual meeting. And we had a great time sharing information on our new statewide effort to restore wildflowers across the state. Our state is known for its natural beauty, and Keep Mississippi Beautiful is working with community partners to enhance the aesthetics of roadways, community entrances and public places by planting wildflowers. Wildflowers face many threats from habitat loss and invasive plants, and this project raises resources to create and restore wildflower areas. We’re grateful for our partners for making this possible! 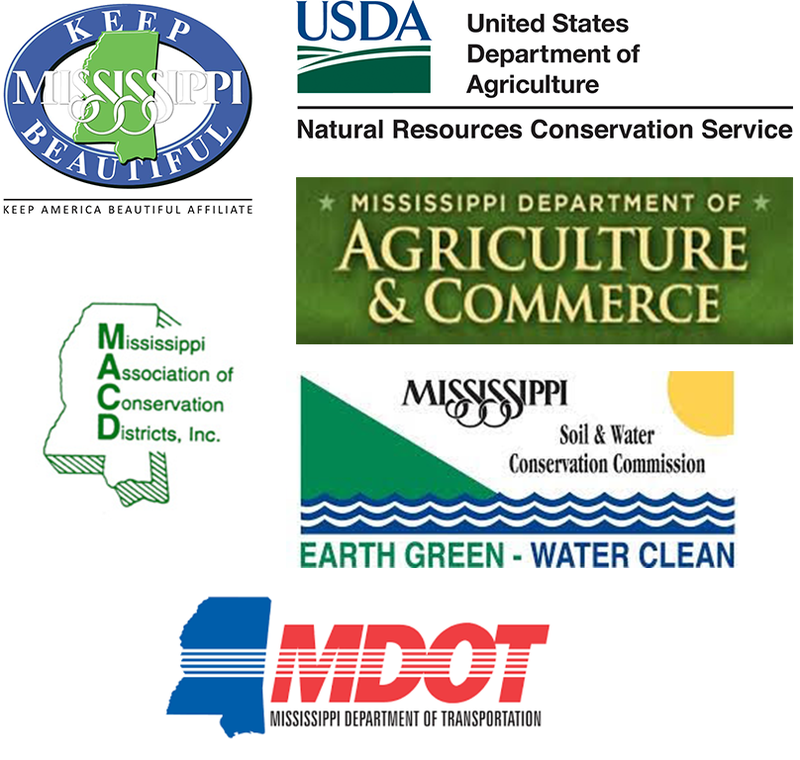 A few of our partners include Jeff Wilson with the Mississippi Soil and Water Conservation Commission, Alana Jacobs with the USDA’s Jamie L. Whitten Plant Materials Center and Gary Blair with the Mississippi Association of Conservation Districts. Litter free, colorful roadways are good for tourism. Roadsides and medians where wildflowers are planted require less maintenance once established than grass areas that need to be cut. Landscaping, such as wildflower plantings, improve property values. Wildflowers provide important habitat for wildlife and insects. KMB received a $20,000 grant from the U.S. Department of Agriculture to purchase wildflower seeds. KMB worked closely with the Mississippi State University Extension Service to develop a seed mix that features a variety of colorful blooms and foliage, thrives in Mississippi and is easy to maintain. This project brings together a variety of partners, including the Mississippi Soil and Water Conservation Commission, Mississippi Department of Transportation and Mississippi State University’s Extension Service. This project complements other state beautification efforts, including the Avenue of the Magnolias and KMB’s Great American Cleanup. KMB is working with about two dozen communities to prepare sites and plant seeds during the next year. For example, we’re planning projects in the median of U.S. 51 in Crystal Springs and of U.S. 49 in Simpson County. We’re also working on a project at the Jackson Street interchange along I-55 in Ridgeland and Nosef Park in Clarksdale. We’re continuing to find more sites, partners and funding sources. Learn more by downloading our latest status report: Wildflower Status Report. Keep Mississippi Beautiful’s Sarah Kountouris, Crystal Springs Mayor Sally Garland, MSU Extension Service’s Dr. Brett Rushing and others look at a possible planting site in Copiah County. The best time to plant wildflower seeds is during the fall, so we’re working to identify locations and start preparing for plantings. We’re working with Keep Mississippi Beautiful affiliates across the state as well as other community groups to find great places to plant wildflowers, such as along roadways, at city and county entrances and other public places. Non-native, turf grasses pose a threat to wildflowers, as they spread across the ground, providing competition to young wildflower plantings. Before planting, we’ll have to apply herbicides to control these non-native grasses. Then, we establish our wildflowers. Our wildflower “cocktail,” or collection of seeds we plant, also includes some native, warm-season grasses. Native grasses are desirable because they thrive in this area’s climate. They also provide nice colors for aesthetics and habitat for wildlife. We’ll keep you posted as we prepare for plantings across the state. See more photos. Have a spot in mind in your community? Email us. Wildflowers provide colorful accents and great habitat in Keep the Rez Beautiful’s Turtle Point Nature Area. One of Keep the Rez Beautiful’s signature projects is the Turtle Point Nature Area, where we have worked the past few years to transform a vacant four-acre site into a vibrant nature area. We’ve used Keep America Beautiful grants, including several Lowe’s and Waste Management grants, to leverage additional support from local and state partners. This support has enabled us to purchase more than a hundred native trees as well as plant a variety of native shrubs and wildflowers. The crown jewel of the Turtle Point Nature Area is definitely our pollinator gardens, which boast a variety of wildflowers, including Coneflowers, Guara, Black-Eyed Susans, Shasta Daisies, Coreopsis and Milkweed. Our volunteers helped us plant this garden in spring 2015, and it is doing so well. We’re excited to continue building on this effort, and we’re especially excited about Keep Mississippi Beautiful’s new Wildflower Trails of Mississippi project. Wildflowers are not only enhance our communities with beauty, but they also provide habitat for wildlife, pollinators and beneficial insects. Let’s keep Mississippi beautiful, one wildflower seed at a time!